Earlier this year I shared several of the projects I did for my home in Florida. Truth be told there are several more that I have yet to share. Here is a set of canvas pictures I did for the Family Room. I created a set of three 10×10 canvases. Thanks to coupons and sales I was able to complete the entire set for about $5. When I first hung them on the wall, I felt they were a little washed out, so I added a navy blue border to the edges. It was a simple and inexpensive project. I really need to find some new ideas to make for the new home in Texas. 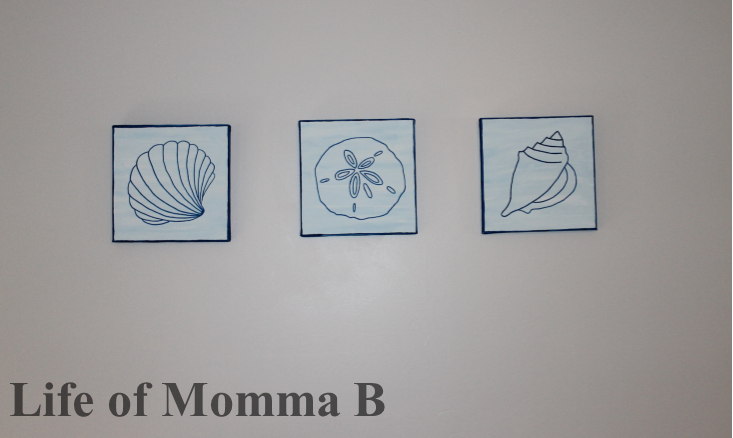 This entry was posted in Crafts, Home Makeover and tagged blue, canvas, DIY, nautical, paint, shells. Bookmark the permalink.